The Food Agriculture Organization (FAO) of the UN launched (March 2017) a toolkit and e-learning modules on Nutrition-sensitive Agriculture and Food Systems. Visit the FAO website to access the state of the art materials on nutrition and food systems designed for policy makers and programme planners. 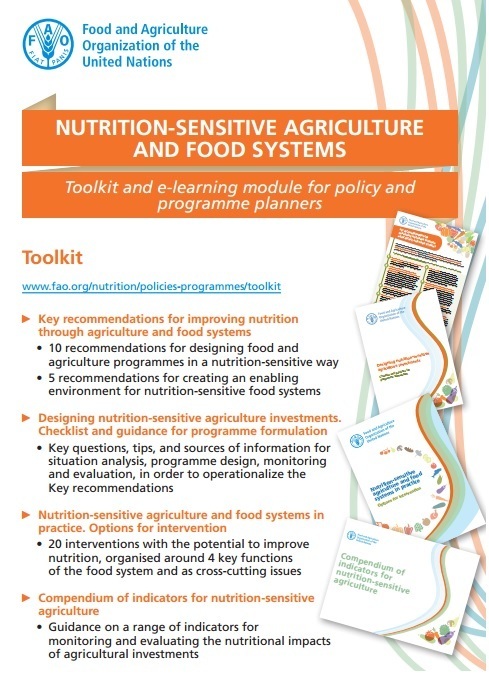 The FAO toolkit and e-learning modules on nutrition sensitive agriculture and food systems are an integrated package of guidance and training materials for designing, implementing, monitoring and evaluating nutrition-sensitive food and agriculture policies and programmes. These tools are key resources to assist professionals working in food and agriculture in effectively integrating nutrition in their work. They are the result of a highly consultative process within FAO and with external partners including development partners (the World Bank and the European Union), UN agencies, NGOs, and academia. Key recommendations for improving nutrition through agriculture and food systems. 10 recommendations for designing food and agriculture programmes in a nutrition-sensitive way and 5 recommendations for creating an enabling environment for nutrition-sensitive food systems. Designing nutrition-sensitive agriculture investments. Checklist and guidance for programme formulation. Key questions, tips, and sources of information for situation analysis, programme design, monitoring and evaluation, in order to operationalize the key recommendations. Nutrition-sensitive agriculture and food systems in practice. Options for intervention. 20 interventions with the potential to improve nutrition, organised around 4 key functions of the food system and as cross-cutting issues. Compendium of indicators for nutrition-sensitive agriculture. Guidance on a range of indicators for monitoring and evaluating the nutritional impacts of agricultural investments. ENN enables nutrition networking and learning to build the evidence base for nutrition programming.